The Dimetrodon (di-met-ro-don) is one of the creatures in ARK: Survival Evolved. Dimetrodon calorector is a much calmer predator than most on the Island. Because it lives off smaller prey than humans, it generally ignores anything much larger than a Coelacanth. Dimetrodon is one of the few carnivores on the Island that could be classified as reasonably friendly in the wild. The sail on Dimetrodon's back is an especially fascinating thing. It can be angled to provide shade from the sun and allows Dimetrodon to disperse heat more quickly. The inner workings of the sail can also restrict blood flow in the creature to hold in excessive heat. Together, these two traits allow Dimetrodon to comfortably survive in any climate, though they are most commonly found in the swamplands which are rich in prey. If Dimetrodon was a bit larger, or didn't have that massive sail, it would make a decent mount. However, its main use to survivors is to utilize the sail's insulating capabilities. Just being near Dimetrodon gives excellent protection from both heat and cold, which has saved my life through more than one ice blizzard in the frozen northlands. Usually attacking Coel or a Megapiranha, the Dimetrodon is not too much of a worry for anything, unless it's provoked by attacks. However, the Dimetrodon is extremely slow and provoking it does not pose much of a threat, as it is easy to outrun or kill them. A sail-backed quadruped found exclusively in the island's central swamps, Dimetrodon is reptilian in appearance but in truth is more closely related to mammals. The large sail on its back serves a thermoregulatory function, as it cools the animal on hot days and helps keep it warm on cold ones. They are fairly timid and sluggish, specializing in hunting prey that is smaller than themselves. This section displays the Dimetrodon's natural colors and regions. 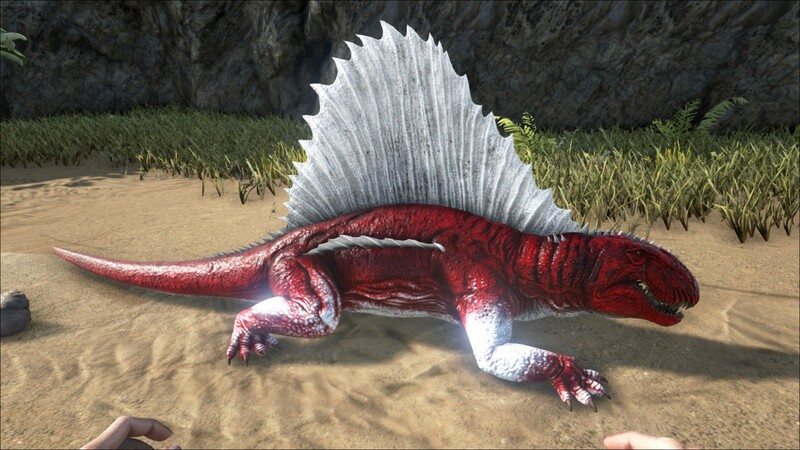 For demonstration, the regions below are colored red over an albino Dimetrodon. The colored squares shown underneath each region's description are the colors that the Dimetrodon will randomly spawn with to provide an overall range of its natural color scheme. Hover your cursor over a color to display its name and ID. 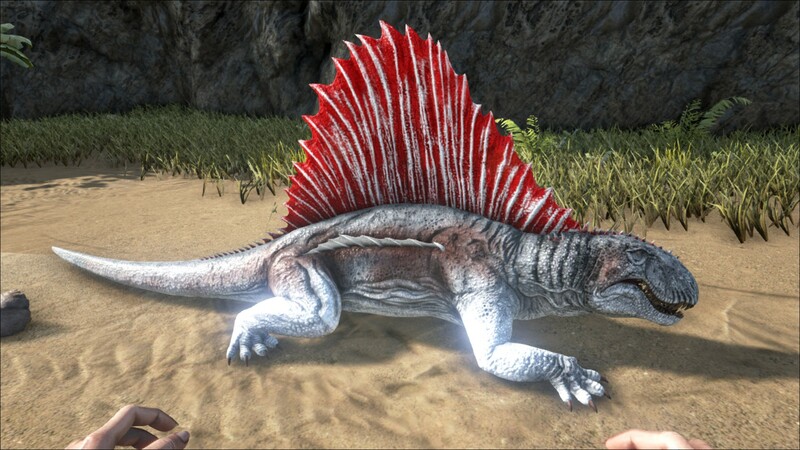 For example, "cheat SetTargetDinoColor 0 6" would color the Dimetrodon's "body" magenta. Slow movement speed on land makes it easy to knock out while walking backward. Hold the Dimetrodon with a Quetzal while somebody else knocks it out. Using low damage weapons to tranquilize it, and continuous shots is the quickest way to knock it out. Dimetrodons are violently tamed, and so require knock-out and narcotics. Its torpor drops extremely fast (approximately 50 per second) - so a large quantity of narcotics are required. This section describes how to fight against the Dimetrodon. The Dimetrodon is very slow and easily killed. It takes time to knock one out due to their quickly dropping Torpor, but their slow speed makes this process easy. Keeping a volley of tranq arrows or tranq darts flying its way can knock it out. Using a club is not recommended. The Dimetrodon doesn't require much strategy to kill or take down in order to tame. A KO or kill is easily achieved by slowly backing away and either stabbing it with a Pike or Spear or by shooting it whilst either backing up or, due to its wide turning radius, circling the creature. Employ the same strategy for taming, albeit with tranquilizing weaponry. Be ready to jump on it with lots of narcotics! Ranged weapons excel in killing and knocking a dimetrodon on land because of their slow movement speed. Use ranged tools in taming as well. The Dimetrodon is not dangerous when left alone and can be easily avoided or killed if necessary. However, if one is hit during a frenzied battle with other animals in the swamp, the player could potentially rile them up, causing unnecessary damage and possibly loss of life. Keep an eye out for their sails, as they often lay below the surface with just their sails sticking out. One of the larger dangers when fighting the creature, oddly enough, is the creatures' surroundings. The swamp is filled with hostile animals and riling up a Dimetrodon can take the focus of a player away from other animals like the Kaprosuchus, which can end the battle quickly with unprepared explorers. One thing to keep in mind is that, while most water is shallow where Dimetrodon can be found, the creatures are surprisingly more dangerous during a confrontation underwater. Without SCUBA Flippers to boost the player's swim speed, a Dimetrodon finds it much easier to close the distance and pursue, whereas it would be easily left in the dust on dry land. They also lack an Oxygen stat, meaning they can stay underwater indefinitely, so trying to escape them via the water is ill-advised. The Dimetrodon's slow speed proves to be its one major weakness, and combined with a wide turn radius makes it almost harmless. Just make sure they do not get the jump on the player, especially in deeper water, or the player could be in for a surprise! Temperature Regulation/Egg Incubator: It has been long and widely assumed that a single Dimetrodon can only grant roughly 90 Hypothermal and Hyperthermal Insulation, which decays over distance from the animal with a comparable range to that of an Air Conditioner. However, it was discovered that higher leveled Dimetrodons provided better and better insulation. Following this, it did not take long to find out that Dimetrodons share the very same mechanic as the Otter does for increasing the given insulation: higher damage stats. The higher the damage percentage a Dimetrodon has, the more insulation it gives. While many players have long overlooked the Dimetrodon in favor of air conditioners, in truth, a single Dimetrodon, who has leveled in damage exclusively, can give insulation far beyond the limit of any single air conditioner. While taming a Dimetrodon can be difficult due to their fast loss of torpor, they can be taken anywhere and only require meat to sustain them, unlike air conditioners which are stationary and require electricity to run. With all these things considered, a Dimetrodon can be the best egg incubator a survivor could wish for. At roughly 1,100 damage, one Dimetrodon can even begin incubating Wyvern Eggs, which require unnaturally high temperatures to hatch. To incubate eggs with Dimetrodons, simply drop an egg closely near a Dimetrodon, and it will take care of the rest, just be sure the egg stays close enough to the Dimetrodon, as the insulation it gives lessens with distance. Usually just one Dimetrodon is all that is needed for incubating, provided that damage is the only thing which has been leveled, but if for some reason you find a lack in the first, a second one is often enough to get the job done, as their insulation stacks with other Dimetrodons. A useful way to utilize the Dimetrodon as an incubator is to build a small 2x2 platform, which can optionally be rimmed with railing on three sides and a ramp going down the fourth. Before the railing is placed, the Dimetrodon can be walked up onto the back two foundations, leaving a visual guide of two other foundations on its side to help you judge where to place an egg for incubating, given that the insulation the animal gives decays with distance. Once the Dimetrodon is placed where you want it, it can be set to passive and weighed down with materials like stone, to ensure it will never leave its position. Afterwards, if your Dimetrodon is still lower-leveled and not providing quite the amount of heat needed for some eggs to hatch, torches can be placed along the railing on this platform to help warm the eggs. If an egg must be cooled, then more Dimetrodons or air conditioners are required. Wild Dimetrodon provide insulation as well, making them a viable option if you do not have the resources to tame them, so long as you keep them in an enclosed space where they cannot wander off. There are a few things to consider while doing this though. Wild Dimetrodon cannot be leveled or bred, meaning you cannot increase their damage stats, and thus you will have to acquire many more than the number of tamed ones required for incubation purposes. Placing an egg within a group of wild Dimetrodon comes with other difficulties, as the wild ones will wander around, and if you have built a pen to contain them; removing the newly hatched offspring can sometimes be a challenge. There is also the danger that if the wild Dimetrodon are somehow provoked by accident, your newly hatched baby could quickly be killed. There is also the matter of having to transport wild Dimetrodon to your holding pen; requiring either a Quetzal, Wyvern, Argentavis, or Karkinos to transport them, or a lengthy time kiting them on foot. Even though this creature is often mistaken for a dinosaur, it's actually a Synapsid, which includes mammals and other relatives of Dimetrodon. In many dinosaur-related media, this creature is seen living alongside the dinosaurs. This is a mistake, as Dimetrodon was extinct long before the dinosaurs exist. In fact, the timeline between Dimetrodon and many of the more popular dinosaurs, like Triceratops and T. Rex, is much bigger than the gap between humans and the aforementioned dinosaurs. The dossier mentioning that the massive sail prevents the Dimetrodon from being a decent mount could be a humorous reference to the fact that for Spinos the saddle rests on the creature's neck. When checking for eggs, try to move it around; as the body covers it up and hides it. Dimetrodons have been shown to lay eggs more frequently while submerged. Their lack of an oxygen stat makes this very simple to do.